View More In CB Radios & Scanners. Yaesu Dual Band Amateur Ham radio transceiver. Transmits the Two Meter & 70cm bands (144-148Mhz/430-450Mhz), & receives 108-520Mhz & 700-999Mhz (less cellular). Features 1,000 Alphanumeric memories, WX alert, PL/dpl, ARTS system, scan modes & more. Compatible with following Optional available Accessories - MH-37A4B, MH-34B4B, E-DC-5B, EDC-6, CT-44, FBA-25A. Dual Band VHF/UHF 2 Meter & 70cm Amateur Radio. CTCSS/DCS (PL & DPL), DTMF, AlphaNumeric Display, Lighted Keypad, Scan modes. Receives 108-520Mhz and 700-999.99Mhz (less cell), Transmits 144-148Mhz & 430-470Mhz, Locking mode prevents accidental changes of frequency. Includes 1400mA Battery, Charger, antenna & belt clip. 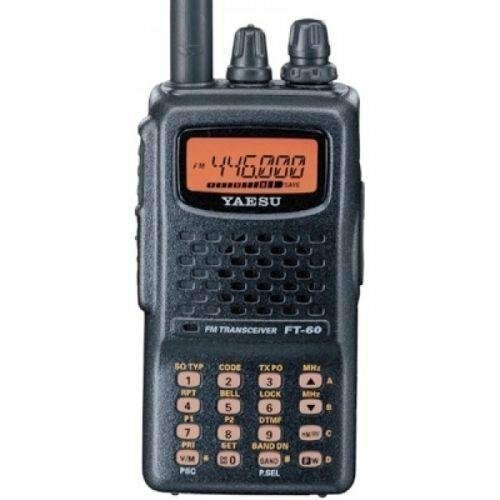 If you have any questions about this product by Yaesu, contact us by completing and submitting the form below. If you are looking for a specif part number, please include it with your message.